Inhabiting the tropical rainforests and dense, secondary forests throughout central Africa, mandrills spend their days on the ground but sleep in trees. Communication is complex among mandrills. Their bright coloring plays a key role in social behavior; blue on the rump and chest brightens when individuals are excited, and occasionally red spots appear on the ankles and wrists. 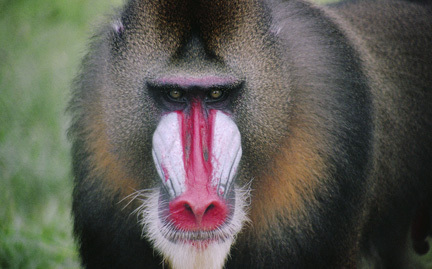 Mandrills are threatened by hunting and habitat loss.